I know what you’re thinking. You’re wondering about the first one-word-bird that ever was. The progenitor of all the one-word-birds we have today. No? You were thinking about something else? Strange. Well at any rate, this week’s post is all about the first. The granddaddy. The Archaeopteryx. Ok, so I may be cheating just a little. The Archaeopteryx is long extinct, and it certainly doesn’t appear on the 2017 version of Clements Checklist of Birds. Or any version, for that matter. It may not even be a single species, with the 12 known fossil specimens possibly representing two or more different Archaeopteryxes. Archaeopteri? Archaeopteryces? Whatever. The point is that we do refer to Archaeopteryx by a one-word name, and it is uniquely deserving of the distinction. If you’re unsure why – like, if you missed dinosaur day in grade 3 – you need only look at the name itself: “Archaeo” means ancient, and “pteryx” means wing. What we have here, folks, is the very first bird. Artist’s rendering of the first OneWordBird. Once upon a time there were dinosaurs. They were big and scaly and cold-blooded, and they roamed the earth (seemingly in the absence of all other animals) for millions of years. Then, 66 million years ago, a meteor struck the earth2 and all the dinosaurs went extinct. But just before that, one dinosaur magically evolved into an Archaeopteryx, and it survived, and now we have birds. Sound familiar? It may surprise and appall you to learn that this account of prehistory is not 100% accurate. It turns out that your grade 3 teacher may not have been a paleobiologist. Go figure. I am not a paleobiologist either, but I can read and I have the internet. So if you’ll permit me a few minutes of your time, I will do my best to paint a clearer picture of the origin and significance of this enigmatic, early bird. It is true that once upon a time, there were dinosaurs. That time began approximately 240 million years ago. That may be a long time ago indeed, but when the dinosaurs came into existence the Earth was already populated with a variety of plants, invertebrates, amphibians, reptiles and even possibly some very early mammals. There were big dinosaurs and small dinosaurs, and they may or may not have been cold-blooded3. They were indeed scaly, although in many dinosaurs those scales became modified into a sort of newfangled structure called “feathers”. In the beginning these feathers were simple – probably used for thermoregulation or mating displays – but over time their structure became more complex and they began to resemble the kinds of feathers we know today. The kinds of feathers that could be used for flying. One particularly feathery group of dinosaurs – the Theropods – included many of the best-known, bipedal dinosaurs from your favourite movies: Tyrannosaurus, Allosaurus, Spinosaurus and Velociraptor, to name a few. 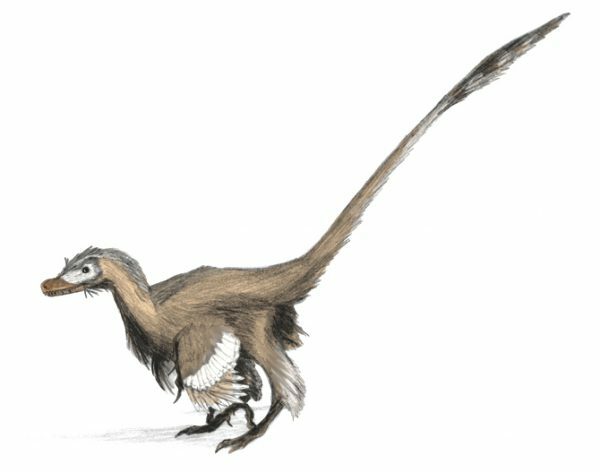 Within the Theropods was a group called the Maniraptorans (including the infamous Velociraptor), and many of these had elaborate feather coverings. Velociraptor even had recognizable wings. This is where things start to get muddy. Jurassic Park would’ve been different if the Velociraptors were accurate. Archaeopteryx was also a Maniraptoran, and its fossils date back to about 150 million years ago. That’s a whopping 84 million years before the extinction event that you learned about in school. It’s also long before the appearance of Velociraptor, Tyrannosaurus or Triceratops, meaning that you can take the idea of birds coming after dinosaurs and throw it emphatically out the window. Adding to the confusion is that the distinction of Archaeopteryx as the first bird is fairly arbitrary. If you could see one alive today, you may not recognize it as a bird at all. It had teeth, for example, and fingers, and a long, bony tail. 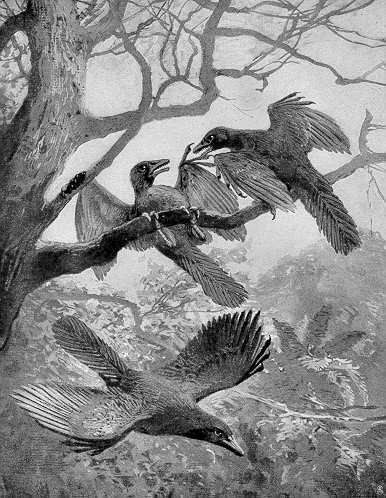 In fact the first truly bird-like creatures wouldn’t arrive until 20-30 million years later. Archaeopteryx wasn’t necessarily the first flying dinosaur either, as it may have been limited to flap-assisted gliding, and it may not even have been the first to do that. So with all this ambiguity, why does Archaeopteryx get the fame and recognition as the progenitor of all birds? For answer to this, try to imagine yourself as a paleontologist in 1861. All you know is that there were dinosaurs and now there are birds, and then one day you uncover the fossil of a small dinosaur with striking arrays of wing and tail feathers preserved perfectly as impressions in the rock. Imagine how mind-blowing, how paradigm-shifting that little animal must have been. It was the missing link, evidence of an evolutionary process that was largely not understood, and that much of the world still did not believe in4. Model of the London Specimen, the first discovered skeleton of Archaeopteryx. Mind = blown. 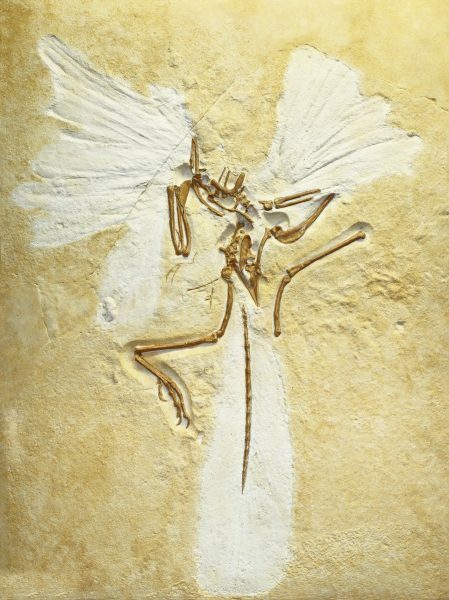 We now know that Archaeopteryx is not, in fact, a direct ancestor of modern birds. It’s closely related to that ancestor though, and it still provides insight into how birds evolved. They continued to evolve and diversify after Archaeopteryx had come and gone, and when the mass extinction occurred 66 million years ago their diversity, small body size, and possibly their ability to fly allowed them to survive when the larger dinosaurs did not. A proper understanding of this story dictates that we should change the way we teach kids about dinosaurs. It is not accurate, for example, to say that dinosaurs are extinct. Their surviving forms walk (or fly) among us today, 10,500 species strong. We must also stop saying that birds “are related to dinosaurs” or “evolved from dinosaurs”. They are dinosaurs, full stop. The truth about Archaeopteryx may not be quite as people think it is, but this early one-word-bird has been captivating imaginations for over 150 years. It has inspired children and adults alike (including yours truly) to learn more about the world they live in, and the incredible creatures that inhabit it. First bird or not, the fabled Archaeopteryx is an invaluable tool for teaching about evolution and generating interest in science and nature. A deserving honourary inductee into the one-word-bird club, if ever there was one. 1Unless you go to the kind of school where God made all the things. 3This debate rages on, but there is reasonable evidence that at least some dinosaurs were endothermic, or warm-blooded. 4An alarming number of people still don’t, but perhaps that’s a rant for another day.